When I see any movie promo that promises to star my most favourite hero ever, I will do just about anything to make sure I watch the movie. 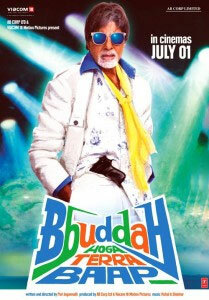 I’ve grown up watching Amitabh Bhachchan movies for as long as I can remember. I don’t claim to be a die-hard or fanatic fan but I do adore this man so when the promos for Buddha Hoga Tera Baap were making their appearances I vowed to go watch this movie on the big screen. This is one of those movies that you just know is going to be flamboyant and you’re going to walk out of the cinema hall humming at least one of the songs from the soundtrack. Amitabh hits the screen with his larger than life presence with a few memorable dialogues from past movies that have you mouthing them along with him. Well, I did, anyway. His fancy and loud wardrobe and funky eyewear had me grinning throughout. He’s a bad-man gangster-type bloke who is flirty and resents being referred to as old. In a twist in the tale peppered with a lot of beeps (his way of being vulgar without being offensive) we find out that the ACP is his son (Sonu Sood) and his estranged wife (Hema Malini) has never let on to their son the identity of his father because he was always in and out of prison. We find out that Amitabh had spent the last 20 years in Paris (oui oui) running a pub. He returns to India for some unfinished business and we can then safely enter Kamini/ Kammo (Raveena Tandon) the ‘item’ number of the film. I think Raveena looked extremely gorgeous but I didn’t like her bimbo role at all. Nothing to write home about and too much of that over-acting nonsense going on. Typical of Amitabh’s 80’s movies you see him shake a leg, beat up the villains (yes, single handed) and instead of being the son making amends with his Mum he is the father trying to make amends with his wife and son. Because I go into a movie theatre without any expectation, I rarely get disappointed. I enjoyed Buddha Hoga Tera Baap with the foot tapping music provided by Vishal & Shekhar, a music director duo I’m quite keen on, musically speaking. A fantastic surprise was hearing Abhishek Bhachchan’s voice in the vocals for Go Meera Go. I simply loved it. And I really must give a mention to the Bhai (don) in the movie (Prakash Raj). I think he is a great actor and so convincing and even in previous movies he has really vowed me. His husky voice is something to write home about…! Yes, this is definitely something I would want to own in my personal DVD collection to add to the pile of favourite Amitabh Bhachchan movies. Starring: Amitabh Bachchan, Raveena Tandon, Hema Malini, Minissha Lamba, Sonal Chohan, Neha Sharma, Sonu Sood and Prakash Raj.